This weekend, I had planned on catching up on some reading on my own and cutting down some brush in our backyard with my father. My wife had planned on just catching her breath, pretty much literally, after being in the hospital for atrial fibrillation and attempting to adjust to her medications. Then Thursday night, one of my college roommates, who is going through a difficult divorce, called to ask if he could come up for the weekend. As we knew he needed to get away and that he had to be back Sunday night, we couldn’t refuse his request. Reading: I’m in the middle of reading The Rubber Band, the third Nero Wolfe mystery, by Rex Stout, and am enjoying it so far. I have a few others checked out on ebook from the Free Library of Philadelphia and in print from our hometown library where I work. However, since I’m not sure if I’ll get to any of them, I’m not going to mention them yet. Watching: My wife and I finished The Defenders, and we thought it was pretty good. I liked the first season of Daredevil the best; she, Luke Cage. My roommate and I also watched a few episodes of the first season of Mr. Robot, which he had been wanting to see. It was interesting, but I don’t think it’s something I feel compelled to watch. 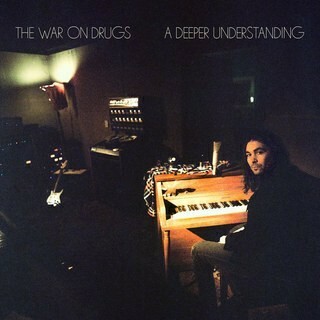 Listening: On Friday, The War on Drugs released its latest album, its major label debut, A Deeper Understanding, and while I’ve only heard a few songs so far, based on those, I’m looking forward to listening to more of the album, maybe later this afternoon. Anticipating (September and beyond): My wife and I are finally going on a wine trip mid-month to wineries on Seneca Lake in New York after one being canceled earlier this year and this one almost being canceled. It is being sponsored by the library where I work in celebration of its 100th anniversary. Two weeks ago, we learned that our 17-year-old car is finally on its last wheels and so by the end of the year, specifically November when it’s inspection runs out, we have to get a new (used) car. Last but not least, my wife is continuing with tests this week and beyond for her atrial fibrillation to see what her next steps will be. All of this is also making me think about my own health, and “taking care of myself” too, something I have put on the back burner for too long. Whatchya reading, watching, listening to, doing, anticipating? Share in the comments. I hope you were able to give your friend the support and comfort that he needed. I also hope that you wife is mending. Is it a heart rhythm problem? Sounds serious. Glad you could take a few minutes to listen and read. It is atrial fibrillation. So yes, serious. But she is getting good treatment so far. I hope you put your photos of the wine tour on Instagram, I will travel vicariously through you all. Very nice that you hosted your friend in need. We need more kindness in this world. We will post photos on Instagram. Putting things on hold to help a friend in a time of need is never a bad thing. I hope you had a good visit and that he was able to set aside his worries for a brief time and enjoy himself! Have a wonderful time on the wine trip. You guys have been through a lot lately and deserve a chance to get away yourselves. Hopefully, Kim will be feeling a bit better and have her meds under control so that there are no concerns while you are away. Take care of your wife AND yourself! I don’t want anything to happen to either of you! Hopefully the wine trip will happen. We are so close to having the minimum needed, but don’t quite have it. Talking to a friend who unexpectedly was diagnosed with diabetes has encouraged me to eat more healthy. My grandma lived to be 98 and my dad is 90 now, but I don’t think I can just rely on my healthy genes to carry me through. Hope life gets back to normal for you this week. I hope the same for me, too! Definitely for you. Hope you are doing well in the midst of the storm.